Summer heat has overstayed its welcome for many in September. But if you're looking forward to cooler weather, Thursday's autumnal equinox is a reminder that fall is finally on our doorstep. The 2016 fall equinox arrives Sept. 22 at 10:21 a.m. Eastern. What happens on the equinox — and why are day and night not quite equal? Check out these five questions (and answers) to learn more. 1. What happens on the equinox? Like the spring equinox in March, the autumnal equinox marks an astronomical turning point of the seasons. From our Earthbound perspective, the sun appears directly overhead along the equator, and day and night are roughly equal in length (emphasis added — see No. 4). 2. Where does the sun rise and set on the equinox? The fall equinox is one of only two days each year when all points on Earth — apart from the polar regions — see the sun rise due east and set due west along the horizon. Until the winter solstice in December, the sun continues to rise and set farther to the south. As the sun takes a shorter, lower path across the sky, we experience more darkness than daylight, and cooler temperatures as a result. 3. How fast are we losing daylight around the equinox? Rapidly! Though the days have steadily been getting shorter since the summer solstice, the earlier arrival of dusk becomes especially noticeable by September. That's because the Northern Hemisphere loses daylight at its fastest pace around the September equinox. The District loses 2 minutes and 30 seconds of daylight each day, while cities across the northern tier lose close to three minutes or more. 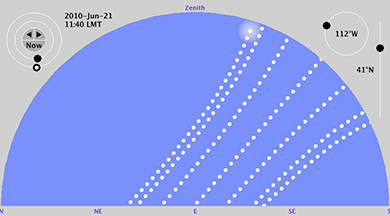 The rate of daylight change depends on your latitude, or distance from the equator. In Miami — located just north of the tropics — daylight dwindles by only 90 seconds a day. At the opposite extreme lies Fairbanks, Alaska. Located just 200 miles south of the Arctic Circle, residents there see nearly 7 minutes of daylight loss around the September equinox — not exactly uplifting! 4. Why are there more than 12 hours of daylight on the equinox? Though equinox means "equal night" in Latin, both of Earth's hemispheres get slightly more than 12 hours of daylight on the equinox. In the District sunrise on the fall equinox is at 6:56 a.m. and sunset at 7:04 p.m., bringing a total of 12 hours and 8 minutes of daylight. There are two reasons for this. One is atmospheric refraction. This optical phenomenon bends the sun's light as it passes through Earth's atmosphere and causes the sun to appear slightly higher in the sky than it actually is. The other is how we define sunrise and sunset. The sun appears as a disk, not a single point. Sunrise is defined as the moment the sun's upper edge appears on the horizon, while sunset doesn't occur until the sun's upper edge disappears from the horizon. 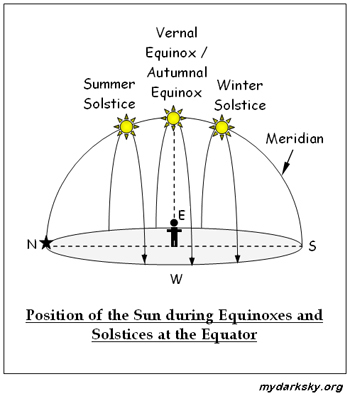 Together, these factors add about 10 minutes of daylight to the equinox, depending on one's distance from the equator. The map below — by Alaska-based meteorologist Brian Brettschneider — shows when we can expect equal daylight and darkness. In most of the lower 48, the exact 12-hour day occurs three or four days after the fall equinox. 5. Why does it get dark so quickly around the equinox? We observe the sun setting much earlier as September progresses, but what about how quickly it gets dark? If you're an astute observer, you may have noticed that daytime transitions to night a bit faster than it did a month or two ago. Indeed, the fastest sunsets of the year occur around the two equinoxes. Notice that at all times of year, twilight lasts longer the greater your distance from the equator (compare Seattle vs. Miami, for example). Yet each location sees faster sunsets — and shorter twilights — around the spring and fall equinox. In March, we usually don't notice the shorter twilight because the days are already getting longer. In September, on the other hand, we are more likely to observe not just how much earlier it gets dark, but also how quickly nighttime falls. As we plunge into the darker months of the year, it's won't be long before temperatures fall as well. So if you're ready for crisp mornings, pumpkins and hot cider, the fall equinox is a day to celebrate.